Bachmann's 1986 catalog introduces 18 new freight cars and among the group is this new paint scheme for the All Door Box Car. The Netherland Overseas example is gone from Bachmann's catalog beginning in 1988. The Santa Fe example pictured above features light blue door panels and no herald. This car appears first in Bachmann's 1978 catalog. No specific stock number information is provided in '78, the All Door is listed only as 1189-Assortment. The '79 catalog is the second and final appearance for this version of the Bachmann Santa Fe All Door Box Car. The Santa Fe example pictured above features red door panels and a large herald. The stock number provided for this car is the Assortment number found in catalogs. 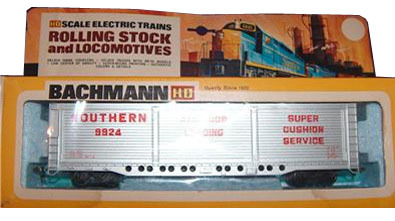 This Southern Railway Bachmann All Door Box Car is seen above in 1970s package that included a fold-up flap on the box to allow for hook display. The Southern example is the first found for this Bachmann freight car in the 1972 catalog. The model in '72 is labeled a 58' All Doors Box Car and retailed for $3.50. The Southern model in 1972 is shown with what appears to be a box car red colored lettering and different font from what the regularly found examples display. This early example also carries the roadnumber 9800, while the typical Bachmann Southern All Door has red lettering and a more prototypical block Southern font and roadnumber 9824. The Southern car holds down the catalog duties through 1975. The All Door is absent from Bachmann's 1976 and '77 catalogs, but returns in '78 with the Southern example joined by the first Santa Fe model with light blue doors. The car's 1978 retail is $3.00. The 1983 Bachmann catalog is the first to display the Southern Pacific All Door Box Car. The car in '83 is labeled by the catalog as 56' All Doors Box Car and sold for $4.00 each. Though earlier Bachmann catalogs gave 58' and later 56', the tooling is basically the same. Early examples of the car were shown with roofwalks and later models skipped them, which could account for the scale two foot difference in the models. This interesting scheme, with the pair of gray arrows pointing to the white circle with the SP in it, appears based on Southern Pacific's 86' hi-cube box cars. One of seven new body styles added to the HO-scale rolling stock line by Bachmann in 1972 is the 58' All Doors Box Car. The car lists for $3.50 in '72 and listed with only one roadname: Southern. A dealer assortment, item 1189, is listed for this car in the 1978 catalog. The retail price in '78 is $3.00 and the Santa Fe roadname is a new addition. I know of at least two different toolings for this All Door Box Car. Examples exist with roofwalks and others have low ladders and no roofwalk. The Bachmann All Door Box Car and the AHM and Life-Like examples from the 1970s are all very similar in design.